This is the first of several parts. An overview of my trip with follow-up stories to focus on beaches, areas, restaurants, scenic sites, historical monuments and places that should be recognized in honor of President Barack Obama. Originally published at Illinois News Network. Part 1: Before visiting Hawaii for the first time in 2012 for my daughter’s wedding, I only knew what they taught us in school about Hawaii’s history. 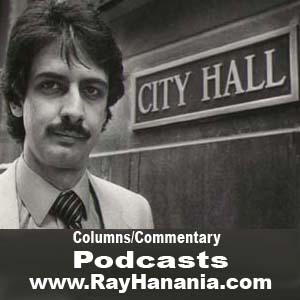 The lessons focused on its statehood, and the Dec. 7, 1941 Japanese attack on Pearl Harbor, and played-down the brutal occupation and theft of the land and resources by European and American settlers. But I had read a few books hoping to enjoy the islands more, only to become depressed by the tragic history of that occupation in the 19th Century and its takeover by American pineapple and business interests. The one that depressed me the most was “Lost Kingdom: Hawaii’s Last Queen, The Sugar Kings, and America’s First Imperial Adventure” by Julia Flynn Siler. That doesn’t mean you can’t enjoy Hawaii and be respectful at the same time. You can. Here’s what my family did when we traveled there last month for a 10-day trip. On our first trip, we stayed at the hotel made most famous by the new version of the TV series Hawaii Five-O, which was popular back in the 1970s and 80s, and relaunched in 2010, Hilton’s Rainbow Towers, which sits on the Southside of the Island in Honolulu, on the west end ofWaikiki Beach, which was the destination of the Hawaiian Island’s royalty in the early 19th century, but became the tourism capitol under the direction of American robber-barons and one of the first popular Pacific islands’ resorts. For any beach stay, I would recommend buying a small umbrella that twists down into the sand, about $24. These beaches do not have palm trees for shade, although they frame all. Waikiki is a beautiful beach that technically stretched from the Harbor and Kahanamoku Lagoon all the way southeast to the beautiful Diamond Head mountain, a long since dead volcano. But the main stretch of Waikiki Beach starts at the Hilton Village and hotels and ends at the Sheraton Hotel, which is about 5 blocks long. The light brown sand is course, rock strewn and slightly littered. It wasn’t my favorite beach. 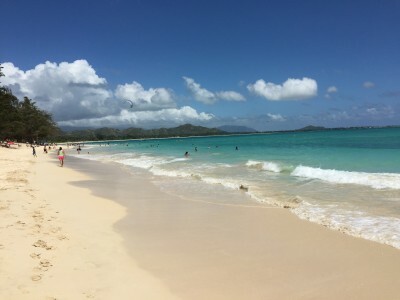 That’s why this second trip, we rented a two-story stand-alone loft on the Northeast or windward side of the island near Lanikai Beach, which is a sister beach with Kailua, named after the nearby town. The ocean-front villas are hugely expensive and ours was less than one block away, which was fine. It was a short walk to Lanikai Beach which is one of the four finest beaches you can visit, but probably won’t unless you rent a car. Make sure whatever you rent allows for parking because parking is in huge demand. The rich upper-class that owns the villas and homes along the beaches do everything they can to discourage people from parking in front of their properties, planting large bushes on open spaces and placing rows of large rocks. But, you will find parking if you get there before 9:30 in the morning. Just make sure you car parks off the street and that no part of your wheel encroaches on the “bike paths.” Police love to nail tourists who park even an inch on the trails and the fines are stiff. 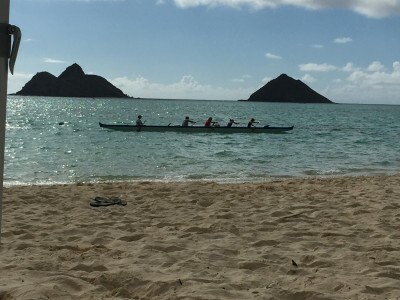 The beach is filled with a lot of morning teams of kayakers, pulling their long boats into the water with 6 – 8 paddles. The sand is power white. The only real hassle will be with the homeowners who walk their dogs up and down the beach, many without much attention and they can be annoying. But the homeowners know each other and I assume they get a kick out of harassing the tourists. Clearly, they really don’t want to share the beach with the public, but all Hawaiian beaches are public, including at all hotel resorts. You can go to any hotel, park in an appropriate parking place and walk to the beach and enjoy it. Another recent law bans all smoking on the beaches and at all parks and public places, so don’t expect to relax and enjoy a cigar here or anywhere. But the water is a crystal clear teal color. The waves can vary from small and calm to huge, so you always have to be careful. Lanikai Beach has some small close-in seaweed covered reefs which you can snorkel, and bigger reefs further out that offer an array of beautiful fish. And the clear sand areas are patchy, so sun bathers and swimmers not snorkeling congregate near each other. 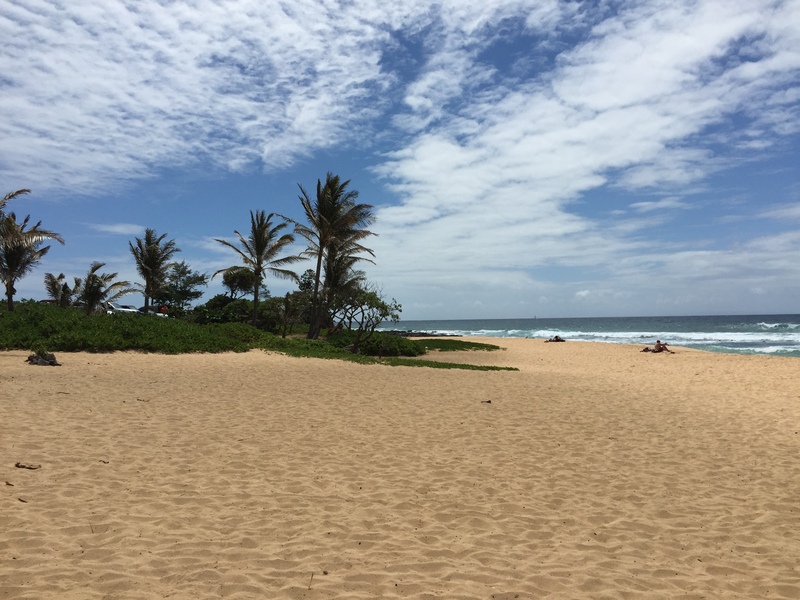 The view from the beach is beautiful and you will see two small mountains in the Pacific Ocean about 500 yards out, Moku Nui and Moku Iki. One is a nature and bird preserve and is closed to the public, but the other is open to the adventurous who paddle out there in kayaks or even on standup surf boards — large wider surf boards that people stand on and paddle in calm waters. About a half mile to the west along the north coast is beautiful little town of Kailua and Kailua Bay which is about 2 miles long. There are more free parking areas but they also fill up fast. We drove there and easily found parking near where we laid out on the beach so it was convenient to bring a large ice chest filled with snacks and drinks without worrying about carrying it long distances. At first, Kailua beach looks like a public beach that is overcrowded with tourists, the kind most people avoid. But it’s not. 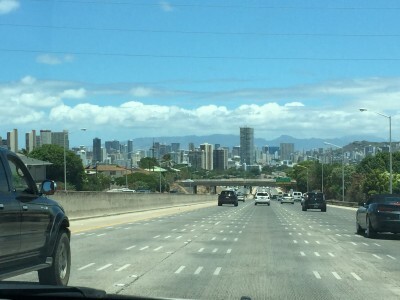 Ironically, most tourists to Oahu don’t travel on their own and concentrate in the hotel district near Waikiki Beach, which can become somewhat of a circus atmosphere. But Kailua is unbelievable. Pure white, powdery sand on the beach and in the water, too. No reefs nearby and it’s clear for 100 yards. About 500 years or more is Popoia Island. There are two parking lots at the east side of the beach and it’s a short walk to one of my favorite restaurants, Buzz’s Original Steakhouse right across the main street from the beach, near the start of an inland canal. This brings me to President Barack Obama, who was born on the island on August 4, 1961 at Kapiolani Hospital in Honolulu. The home where his mother and father lived is further to the east along the south coast, adjacent to the Paiko Lagoon Sanctuary and Bay. It was easy to find. Obama stays in the area, at the northwestern end of Kailua Beach at the villa of Pearl Jam rock star Eddie Vedder, which isn’t too far from the huge Marine Corp Base (MCBH) and the Ulupa’u Crater (further north). When the Obama’s visit the island, you can expect traffic delays, closed roads and the small bay where he stays closed off to the public, according to many locals who live nearby. I thought we could handle the sun longer than four hours, but during the summer months, the temperature may read 90 but the beaches feel more like 100 degrees. So by 2 pm, we returned to the loft, washed up and toured the island. One of the first places to tour was the small town of Kailua. It’s a modern city with a Target, lots of McDonald’s but also other cafe’s and specialty restaurants. Lot’s of parking so you don’t have to worry. So we drove through the town and enjoyed several restaurants and different ethnic cuisines. The first thing you learn when you visit Oahu and Pearl Harbor is that the United States may have defeated the Imperial Empire of Japan, but the Japanese are the largest presence on the island and while were there, the largest group of tourists, too. Oahu has a huge Japanese population and culture that is probably more sympathetic to the Native Hawaiians. And you can see the difference in attitudes among the tourists. Most of the Japanese tourists I saw were young. Most of the Americans I saw were seniors. Hawaii is a bucket-list destination for many Americans because it’s a 10 hour trip from the east coast, nine hours from Chicago, and that’s if you take a direct flight. Add in the five hour time zone difference — Hawaii, of course is five hours behind us, and you can see why many Americans may see Hawaii is a once-in-a-lifetime vacation while the Japanese have a much closer flight and cheaper travel packages. There are also a large number of military personnel stationed on the island who worked there and retired there, too. Lucky them because everything costs about 75 percent more to purchase on Hawaii. We stopped at Foodland grocery (which is a large grocery chain) and the food costs where so much higher, obviously because much of the products have to be shipped to the island. It’s pricey so be prepared. We spent 10 days on the island and after enjoying the two beaches near us, we drove everywhere. 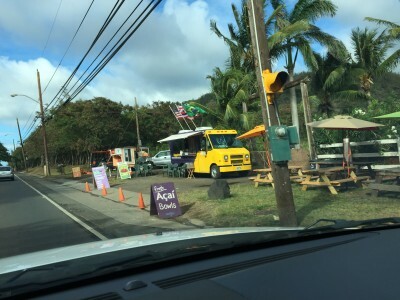 Our first excursion was along the north coast which is dotted with beaches and food trucks. Yes, food trucks. They offer everything from popular skewers of garlic shrimp to ice-cold fresh coconuts and Lychee. The drive is breathtaking, nearly everywhere. The mountains frame almost every perspective. The roads are safe, but slow. But we did the north coast in two hours, adding time for stops, and an hour for a return to our loft. Heading east along the coast is Waimanalo which has wonderful beaches and several scenic stops including the Halona Blow Hole which is adjacent to a very small beach that you can only reach by taking a somewhat steep path down from the road which was made famous in 1953 in the movie “From Here to Eternity,” Halona Bay. The beach has a small cave you can enter that leads under the road about 200 feet to a small opening at the end. It’s safe but filled with some rubbish from irresponsible campers. 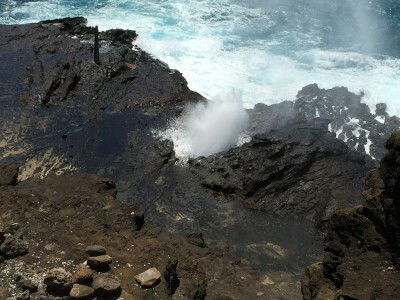 There is a large parking lot where you can pull over and take great pictures of both the blow hole, a hole in the reef that spouts small to huge blasts of water straight up as the waves crash into its sides, and the Lancaster-Kerr beach. The beach is small but beautiful and if you have seen the movie, it hasn’t changed much from when Burt Lancaster and Deborah Kerr kiss while lying down on the beach. Don’t be afraid. Just be careful and hike down the step-like reef steps and path which you can see from the famous movie scene of Lancaster and Kerr kissing, hasn’t really changed in a half century at all. 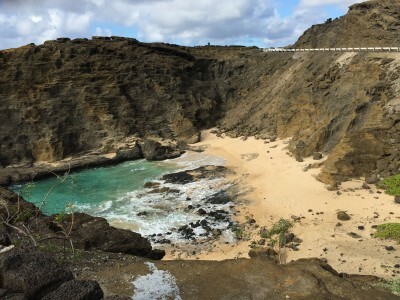 You’ll also pass Koko Head park, the also dead volcano crater, Sea Life Park where you can enjoy lots of fun, and the Hanauma Bay park where you can snorkel. The problem is the park opens at 6 am and by 7 am, it’s packed and long lines of people are cars wait until people finish. If you want to snorkel, get up early and get there by 6 am. The morning swim is worth it, especially in the summer months. 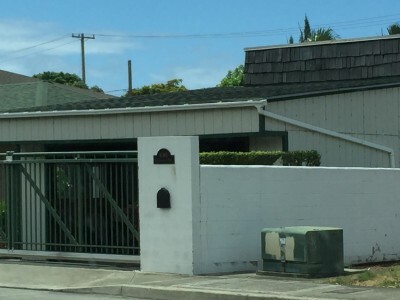 Just past that as you now head toward’s Honolulu and Waikiki beach along the south shore is Paiko Lagoon where Obama’s first home when he was born is located. North from Lanikai is more breathtaking and takes you into the farmlands and more native areas. You’ll see many signs on the side of the road declaring “Keep the Country Country.” And “Enough Hotels Already,” and “No More Hotels.” Most of the trip will be on the Kamehameha (Ka-meha-meha) Highway, named after one of the island’s royal family dynasties. 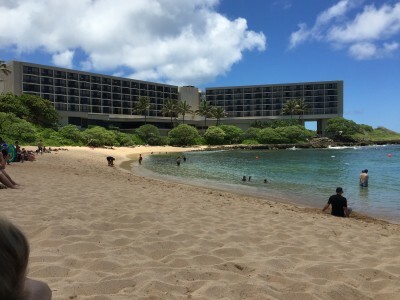 You will pass many great looking beaches as you drive towards Turtle Beach Hotel and its beautiful but small Kuilima Cove on the east side of the hotel and Turtle Bay on the west side. We spent a day at Kuilima Bay and loved it. But further down is my absolute Number 1 Beach of all time, Sunset Beach. The sand is soft and the waters are crystal clear. The waves can be huge but I enjoy waist to shoulder high waters anyway — thanks in a large part to the frights caused by the movie “Jaws,” and author Peter Benchley, who ruined swimming for everyone. Sunset Beach is a large beach with more than enough parking along the side of the road and also a parking area along with Sunset Beach Park. It’s all free, like parking we found everywhere. It’s not crowded at all. There’s so much more including “Shark’s Cove,” which is really a shallow snorkeling area with small reefs and calm waters. It’s perfect for kids and their families. One area is for novices, and the other is for seasoned snorklers and divers. The crown jewel of the north shore drive is just beyond Shark’s Cove at Hale’iwa Town which has several streets with cafes, souvenir shops and ice cream parlors. Park and spend the rest of the day there enjoying the small town Hawaiian ambiance. From there, it is a start drive through the island back either through the southcoast and Honolulu, or back to the east coast and Kailua. The South coast is also worth seeing, of course. And if you have never done so, you need to visit Pearl Harbor, although you should book your tickets before you arrive. You can buy the tickets and take a cab from Waikiki, or drive there from Lanikai and Kailua. Waikiki Beach is also easily accessible. There is a large parking lot where you can pay about $11 to $30 for 5 to 10 hours. It’s a short walk past the Army Museum, which is across the street and right near the north end of Waikiki Beach. There are many historical museums including the Palace of Queen Emma, which is small and may take an hour to see the home of a past Hawaiian Queen and Hawaiian royal customs. There is a modest entrance fee to help cover the costs of maintenance and care. So much Hawaiian heritage was stolen and worse, destroyed, and this museum strives to preserve what remains. There is also the more expansive and detailed Bishop Museum, which is free. The Bishop Museum offers lots of detail on Polynesian, Hawaiian and the cultures of the Pacific (Oceania). Downtown Honolulu is like a more exotic New York City, but without the danger.